originally released on paper at m^s 2001, now available in digital form (pdf). read nfo for more. enjoy! Amazing, a scene paper mag, interesting how the perspective changed in 10 years. Thanks for submitting this! Cool :) Wish there were more like these. Great magazine, covers a lot of platforms, including exotic ones. Gives a good overview of what's happening on platforms different than the one you're active on. Also, nice layout. Oh yeah I remember creating a bunch of copies of this 'treasure' right before the party. funny read with funny english. funny articles! and yeah some treasure from the past! Seems very nice: multiplatform and demo oriented... Will read it soon. this sure brings back some memories. dont know where i put my original paper version. very nice coverage on the state of the art in 2001 of all those demomaking alternative platforms. Duh, pdf emulated hw suxx! 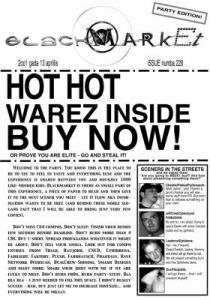 Wow, there are interesting demoscene articles for a lot of different exotic platforms, also I was suprised to see an old CPC article from Antitec, he might have told me about it but it was so many years ago and totally forgot it. wise decision to re-release it 10 years later! rulez added on the 2011-10-22 16:36:02 by ɧ4ɾɗվ. Thanks Dip for getting this re-released! // Those days back then will never be forgotten..
page created in 0.023360 seconds with 15 queries.